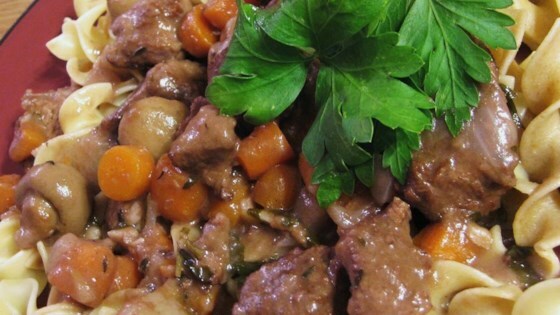 "Hearty, tender beef in a sumptuous red wine sauce. This is an easy and tasty dish. Definitely not the normal casserole." Melt the butter or margarine in a large skillet over medium high heat. Add the meat and brown well on all sides. Pour this into a 2 quart casserole dish. Return the skillet to the heat and add the onion, carrots and garlic to it. Saute for 5 to 10 minutes, or until onion is tender. add the wine, bay leaf, parsley, thyme, and liquid from the mushrooms. Pour over meat. Bake, covered, at 350 degrees F (175 degrees C) for 2 1/2 hours. Remove cover, add canned onions and mushroom crowns, and bake for 30 more minutes. This was very good. After the initial 21/2 hours there was virtually no liquid left I had to add more wine. I also covered it the whole time. I would make this again.